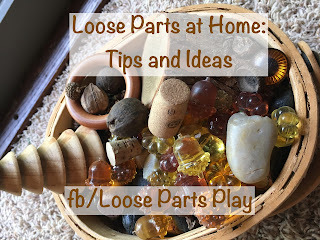 As you all know if you read the blog, I assert there are many, many ways to "do loose parts". Read my blog post 30 plus ways to approach loose parts. There may be some overlap in these posts as the principles can be similar. In the home setting there are often many considerations, such as a variety of ages, wanting to keep parts of the house tidy, safety concerns for younger children, etc. I am treating this blog post as a mother, not as an early childhood educator, college instructor, presenter, etc., sharing what has helped us in our home. How do we keep sanity with all the loose parts and strike a balance between allowing free access and keeping a house running smoothly? I admit we are always trying to find that balance; however, these are several ways that work for us. Grab and Go Bags--Create small bags that easily can be taken to use while out and about, waiting for dinner at a restaurant, during quiet time, etc. See some examples here. Here is another example of a robot tinkering kit. These could be fun to do as a swap as well with other families. I like that these are containerized and can be pulled out quickly and put away quickly. Treasure Baskets—A well curated basket is perfect for infants and toddlers. Think of textures, safety, and opportunities for exploration. Scarves, textured fabrics, mouthable wooden blocks and other items, large, smooth shells, etc. are great additions. Additionally, I find that a nice basket on the floor can contain different loose parts near the front door, by a low work table, or in the kitchen. This can easily be moved and stashed away if you don't want it out. Seasonal Provocations--We like celebrating holidays at our house. Why not combine this with the theory of loose parts? We have a gallon ziploc bag of loose seasonal stuff for most holidays. We pull these out and put them in a basket for play. We also bring out different play dough cookie cutters and other holiday related items, such as silicone pumpkin ice cube trays. Check out these ideas for Valentine's Day. Playdough/Clay--Playdough and clay are such a great base material for molding, stamping impressions, building, connecting, and experimenting with textures. Both playdough and clay have a unique feel. There are many recipes available for playdough; we like this one. Clay is such a neat natural substance. We enjoy using clay to make “faces” with natural elements on trees outside. I don't leave playdough or clay out all the time, but it can be a great way to explore many materials while getting creative. Tinker Desk--We have one child in particular who is constantly building, making, constructing, deconstructing, etc. He wanted his own space so we repurposed a desk for tools, things to take apart, etc. If he wants something and we're not sure where to put, it goes on the Tinker Desk. This is his space and has what he needs--cardboard, popsicle sticks, tape, etc. He's the one we gave a nice tape dispenser for his fourth birthday--he still uses it! He likes taking things apart and using them in other creations. Duct tape, wire, and paper are his best friends! Here is one example of a robot tinkering kit. Rosie Revere Engineer and The Most Magnificent Thing are great books to pair with this. Loose Parts Inspired Toys—Some toys are more opened ended and have a loose parts vibe. Check out my list here. Think magnetic blocks, moveable marble runs, fort kits, etc. If Grandma insists on buying a birthday present, send her this list! Art/Loose Parts Cart--You know those stacked carts that have maybe 3-4 trays from Ikea? We have one next to the Tinker Desk above and one closer to the kitchen. The one by the kitchen has basic art supplies, such as glue, tape, coloring pencils, markers, scissors, etc. It also has plenty of loose parts such as pipe cleaners, popsicle sticks, feathers, rocks, etc. It's nice to have some basics in one spot so we know where to find them all the way. It can easily be rolled out to the table for a work space. Outdoor Play--While I have given many ideas for inside the house, my favorite application is outside. We have a small mud area with buckets, shovels, and dishes from garage sales. We have boards the kids can move around, a set of large ramps, tree cookies, and more. We live in a nature rich area and collect acorns, sticks, and plants for loose parts. We intentionally have flowers near where the kids play that are hearty and can withstand some experimentation. There are lots of options for loose parts in nature, such as land art, fort making, and so much more! We have a few larger crates with specific stuff, like fabric, stuff for fort building, fairy/gnome stuff, etc. "Hidden" Stuff--I like to keep our main living room space clear of too many loose parts as it's nice to have one area of the house that is picked up a bit more. Don't worry, there are plenty of adjacent play space. My exception is that we have a shallow drawer with no hardware right under our open coffee table that houses Legos. The boys can play there whenever they want and it's easy to slide it out on the carpet and whisk it all back in the drawer. This may not work for families with younger children but your day will come when it will. Loose Parts "Decor"-- One way we have incorporated loose parts is just part of the décor. Think of colorful scarves hanging from hooks or a zen sand garden with moveable items. This last Christmas we had a printing tray filled with loose parts and holiday baubles. Everyone around the table interacted with the loose parts before and after dinner as well as during down times while the materials were out. Currently, we have a bag of fall loose parts out right now. Buttons/Collections--Buttons, buttons, who has the buttons? Think button or nature collections. These are sorted, categorized, and used for building and creations. The books, Sort It Out and Grandma’s Button Box, are good books to go with this type of loose parts play. “Junk” Jars and Junk Play—Loose parts play can be as simple as allowing children to interact with “junk” in their own way. You may do this by collecting junk in a big jar. I use an large, empty "snack" jar, often from pretzels or animal crackers. I leave it on the side up in a cabinet and can just put random things as I find them. I pull this out when the children are interested or if we just need a change of space. Junk could be unneeded items, extra screws, netting from oranges, scrap wood or fabric, etc. Larger “junk” could be leftover building materials old tubes, etc. Children can create and build with the materials. This would be a classic of how we grew up scavenging for junk in abandoned lots or similar to the storyline of Roxaboxen. Natural Treasures--You know nature creeps into the house all the time. Start talking to your children about collecting stuff from early on. I give the guidelines we use in this post about Natural Treasures. Consider having a basket by the door to leave the treasure, reminding the children that nature needs to stay outside (if that is your philosophy--not ours), or providing an egg carton to keep the treasures contained. Consider baking some natural items before bringing them inside to avoid critters inside the house. Parties--With four boys, we host a lot of parties at our house. With many of the kids, we try to have some type of loose parts component in the play. Have a party on a specific loose parts theme. Loose parts play can also be incorporated into just about any type of celebration or party. Whether it is having loose parts out as a centerpiece that people can play with, having specific open-ended play opportunities, or having a whole Build It party, play is meant to be a part of celebrations and parties. Here is an example of using loose parts in a pirate themed party, a fairy/wild thing party, and International Mud Day. What works for you in your space? Each of us will have a variety of challenges and opportunities in our spaces. What works for one may not work for another. Note What You Already Have--You probably have a lot of "loose parts" already. Your first step is to identify what you already have that could be used in this type of play. Perhaps gather it to one space, such as a cart, so it can be used more readily. Starting Small--My list above can be really overwhelming. Am I right? I have been doing this well before I knew what the term is and now my youngest is five, so I have had some time to accumulate and refine practices. Find one thing you want to try and figure out a plan to make it work. Try to give one holiday present that includes loose parts in some way. You don't need to have all of this overnight--start small, one step at a time. Flexibility--Realize that at times we can be flexible. When my kids were building a whole city with large cardboard boxes right behind our living room couches, I allowed them to stay up for several weeks until they became disinterested. Consider having a "works in progress" shelf where a project that is being worked on can be stored for another day. Involve the Children--The children know what they want to play with. Let them lead the way. Follow their interests. Involved them in the selection and where to put loose parts in your home. I find mine like to be in our main living area where the people are, so I try to have some flexible options that we can bring out for those times or include it in the decor of that space. If there is something I think they may want, I ask. If there is no interest, I feel no qualms about tossing it in the recycling bin. A "Yes" Attitude--I really try to say yes as much as I can. While there are certain hazards to be aware of, does it really matter if my son wants more paper, the tin can from recycling, and the scrap of yarn he just found? Not really. Yes, you may have this. I do appreciate that they ask. Ways to Store/Manage--Consider a limit on the amount of "stuff" that you keep--it might be a large tub or a certain set of shelves. This helps keep it freshly stocked and helps it so it doesn't overtake your life. Consider spreading out a sheet, using a tray, or working at the table to define a boundary for the play. Remember to be flexible if the play needs space at times. Designating a Space--Consider having a few shelves with baskets, metal containers, etc. to house your loose parts. I like having a "loose parts" play area. Knowing When to Let Go--One thing I love about loose parts is the recyclable nature of many loose parts. Know when it's time to recycle the components to make room for more creations. Hide Things--Kids can know where hidden things are if you choose, but it doesn't all have to be out. Just like our Legos fit right under the table, metal bins keep things in containers on low shelves for the kids to access. Rotate--I suggest not having everything out at once. Rotate items to keep things fresh, asking for child input into what they may want to explore. Cultivate the Mindset--I find that most of my kids (except the teenage math nerd--I say this with affection) have developed a mindset of repurposing and seeing things in a different light. They see potential in things and eagerly ask for the new boxes coming in the house. What tips do you have for other families trying to include more loose parts in their homes? Thanks for sharing your ideas!